Defying Poverty with Bicycles: It’s Time for Universal Transportation in the U.S.
It’s Time for Universal Transportation in the U.S. Here in the U.S. there’s been a lot of chatter over the past decade about the declining gas tax revenue and finding alternatives. Now that chatter is getting rather shrill, touting alternatives limited by cultural quirks like an inherent terror of raising general taxes, an adoration of anything techno-complex, and a belief that each travel mode is used by an entirely different species from the others. Drivers never walk. Bicyclists never drive. And who are those bizarre bus riders anyway? These sci-fi assumptions force discussions of gas tax alternatives into far flung realms focused entirely on car drivers. No need to recognize that taxing only drivers was wrong from the start and led to all other modes being shortchanged. Each alternative requires years of meetings, legions of consultants, and a battery of harassing surveys to even explain the concept let alone how each would actually work. Here’s an article about one recent proposal—taxing car drivers per mile they drive. Any school kid could come up with the obvious problem with that one. And sure enough, as you’ll read in the article, decades of surveys have shown that few people like the idea of big brother tracking them. Duh. What infuriates me is that nobody, at least here in the U.S., seems to realize that everyone should have the right to use every mode of transport. This strikes the same fury each time I fail to avoid a “debate” over universal health care for our country. Why are we still discussing this? The United States is the only developed country without universal health care. Many undeveloped countries provide it, too. Basic rights. The basic right to health care. The basic right to move around as we choose. These rights should not be questioned or debated or skirted with preposterous techno wizardry alternatives that focus on one travel mode and only deflect the obvious solutions. To me, the obvious solution for replacing the archaic gas tax is to raise general taxes for everyone and require that tax money to provide universal transportation choices for everyone. We’d pay no more, and likely less, than what we’d pay through that big-brother driving fee because all those administrative and consultant costs would vanish. 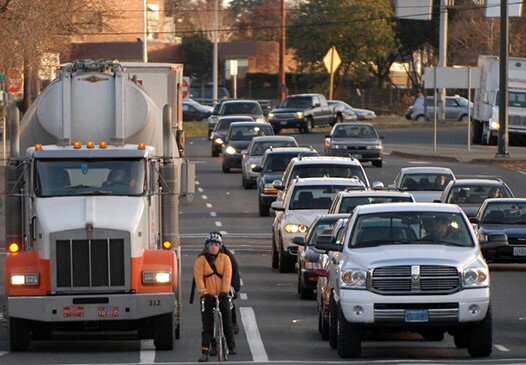 This would mean that every transportation dollar spent would have to ensure that all modes are provided for—drivers, bicyclists, wheelchair users, other pedestrians, even delivery trucks. Lots of compromising would have to occur. For instance, trucks would no longer be able to enter busy downtowns, but these fabulous cargo bikes would take their place. Car speeds would have to be reduced, but better intersection designs that accommodate non-motorized travelers would actually allow for better traffic flow and shorter travel times even for cars. Public transit such as busses and trains would move from the fringe to central in every transportation system. And all travelers, no matter their income level, would have equal provisions for the mode of travel they choose. Here’s just one site showing street transformations that accommodate all users now. Imagine how many more streets could be changed (or built from the start) like those if all transportation funds had to be spent this way. So let’s stop bickering about the latest techno-wiz-bang gadget for spying on car mileage and refocus all those ill-spent survey dollars on an across-the-board tax increase that pays for universal transportation for everyone. Then we can honestly call our country the “land of the free” – free to choose how we travel without big brother watching. What are your thoughts on this universal transportation idea? Please offer them in the comments section. I'm for raising gasoline taxes and for greater taxes on anything that causes us further expense (pollution, climate change, war). This will encourage less driving and more fuel-efficient cars. Gas prices will likely go up, but are no stranger to supply/demand. If $1 is added to each gallon of gas, well, that is one more dollar that comes back to the public and doesn't go to oil companies. Really, which would you prefer? Europeans have made the smart choice. But in our culture, it's a tough sell to expect a tax on one mode to be used to improve another. 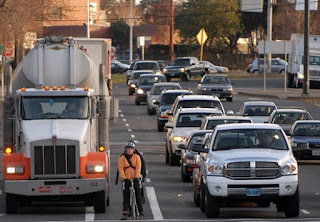 We've seen this result for decades--nearly all gas tax funds have been used to build speedways, toll roads, "smart transportation" (those stupid signs that tell you're about to be stuck in traffic), and other exorbitant roads and gadgets that do nothing to improve the bicycling environment. I figure a universal tax for a new concept, "universal transportation," would have a better chance. I do agree with imposing penalties for driving, but in order for a financial penalty to benefit bicycling, it would have to be presented as such.